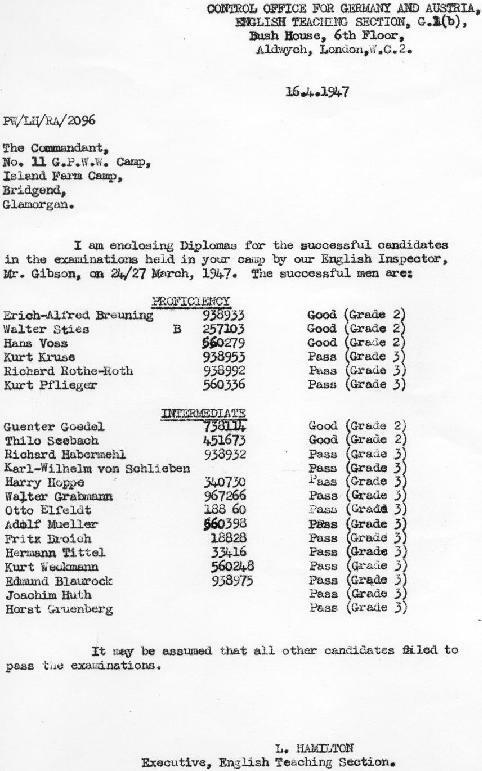 Many of the prisoners pursued English lessons taught by some of the other German officers in the camp. is the headteacher and in charge of education. His English is fluent and correct and his words are well-chosen in conversation. He has spent some time in the USA. is also fluent in conversation and has a very pleasant personality which should make good for teaching. is not fluent but has a good knowledge of English for intermediate pupils. He is more hawk-like and it is presumed that his classes entail much discipline. seems slow to assimulate and seems sharp-tempered . However should be satisfactory for Intermediate pupils. Leutnant Dr. Hans Gerd von Rundstedt. is the "baby of the family" and has been brought to this camp on compassionate grounds in order to be with the Field Marshal, his father. 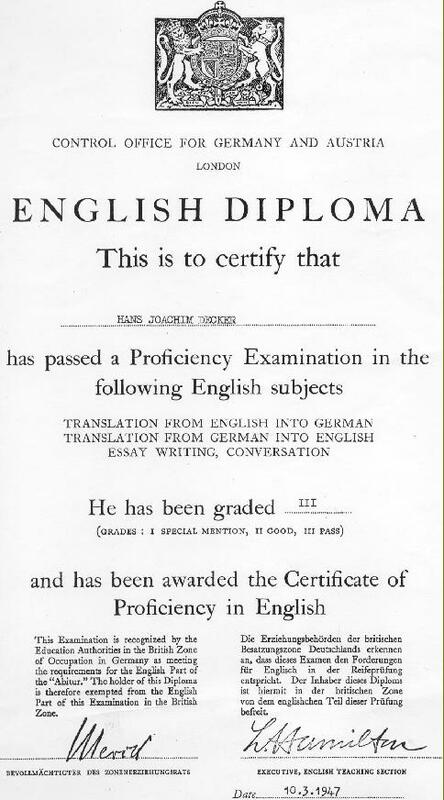 The Leutnant's English is reasonably good considering he only teaches beginners . He is of the fawning type; probably this is enhanced by the prescence of the others , all of whom are of General rank or equivalent. The libraries for officers for officers and O.Rs (Other Ranks) are quite separate. The officers' library is sadly lacking in dictionaries. As many as 40 Cassells' dictionaries were ordered several months ago and about 30 other types. The only receipt so far is 3 Wichmann . There were requests for several copies of one book for class study, and also for some thrillers. Most of the instructions seem to be transmitted through Admiral Voss. All the Gen. Officers in UK are expected to concentrate this this camp and it appears that the Army Officers being the Senior Service, are endevouring to fill all the admin. positions within the wire to deprive the junior services of having any say in the matters. 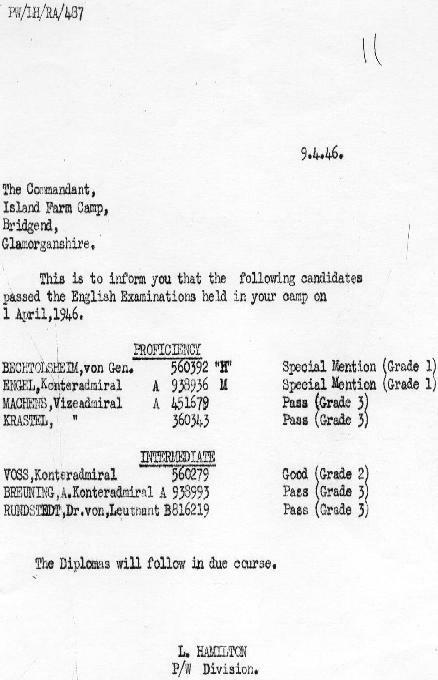 The date of opening this Camp has been stated as 17th November 1945 but the first officers came 6th January 1946. It is suggested by the I.O. that, when lecturers visit the camo, they should either be special lecturers or lecturers specially prepared for these high ranks since the normal lecture delivered to O.Rs seems out of place here and, in matters political etc. these officers "know all the answers" and delight in conradicting the lecturer on details in which they have had personal experience. This does not affect English Inspectors' talks where the subject matter concerns only the linguistic aspects. The Librarian, Gen.Maj Wulf states that more G.O.S are needed to make up a deficiency for 20 pupils. (This would be on basis of one per pupil). The Welfare Fund is shown as unlimited. It stands at £24.3.10 1/2 today with £33 to come from the Canteen together with a fresh allocation on 1st April 1946.